This investigation was designed to evaluate changes in plasma and muscle levels of free amino acids during an ultra-endurance exercise and following recovery. Nine male ultra-endurance trained athletes participated in a 24-h standardized endurance trial with controlled energy intake. The participants performed 12 sessions of running, kayaking and cycling (4 × each discipline). Blood samples were collected before, during and after exercise, as well as after 28 h of recovery. Muscle biopsies were taken before the test and after exercise, as well as after 28 h of recovery. During the 24-h exercise, plasma levels of branched-chain (BCAA), essential amino acids (EAA) and glutamine fell 13, 14 and 19% (P < 0.05), respectively, whereas their concentrations in muscle were unaltered. Simultaneously, tyrosine and phenylalanine levels rose 38 and 50% (P < 0.05) in the plasma and 66 and 46% (P < 0.05) in muscle, respectively. After the 24-h exercise, plasma levels of BCAA were positively correlated with muscle levels of glycogen (r 2 = 0.73, P < 0.05), as was the combined concentrations of muscle tyrosine and phenylalanine with plasma creatine kinase (R 2 = 0.55, P < 0.05). Following 28-h of recovery, plasma and muscle levels of amino acids had either returned to their initial levels or were elevated. 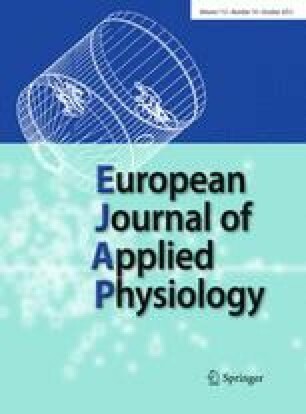 In conclusion, ultra-endurance exercise caused significant changes elevations in plasma and muscle levels of tyrosine and phenylalanine, which suggest an increase in net muscle protein breakdown during exercise. There was a reduction in plasma concentrations of EAA and glutamine during exercise, whereas no changes were detected in their muscle concentration after exercise. The authors wish to sincerely thank our courageous participants and gratefully acknowledge the valuable contributions made by the supporting staff involved in the experiment. This study was supported financially by grants from the Swedish National Centre for Research in Sport and the Swedish School of Sport and Health Sciences.